Buy both of Anna Mazon’s classes together and benefit from a £70 discount on the price of each class bought individually – bundle price £500. Plus if you buy the bundle, you can take advantage of instalment payments. Pay a £100 non-refundable deposit and then clear the balance by the end of April 2019. Classes run from 26th – 31st May 2019. Numbers are limited for this offer so book early. Fantastic offer – Anna Mazon’s Master Class Bundle! Buy both of Anna Mazon’s classes together and benefit from a £70 discount on the price of each class bought individually – bundle price £500. Plus if you buy the bundle, then you can take advantage of instalment payments. Pay a £100 non-refundable deposit and then clear the balance by the end of April 2019. 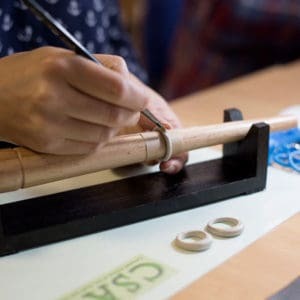 Classes run from 26th – 31st May 2019. Numbers are limited for this offer so book early. 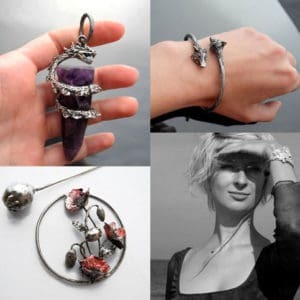 This is a three day metal clay workshop in which you will make a Fantasy Eye Pendant with Polish metal clay artist and tutor Anna Mazon. 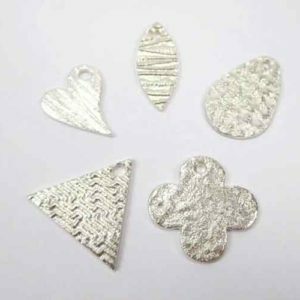 30g Art Clay Silver is included in the price. This class runs from Sunday 26th May 2019 to Tuesday 28th May 2019. 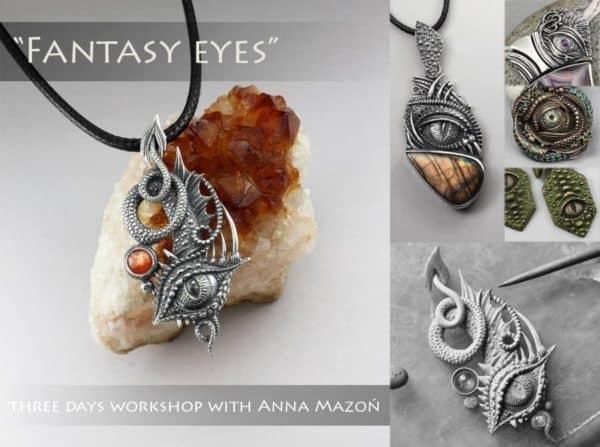 As usual with Anna Mazon’s classes, it will be packed with lots of different techniques, featuring an eye motif (hollow from the back) and various sculptural ornaments which create a narrative context for the eye and a bezel set stone in the shape of your choice. 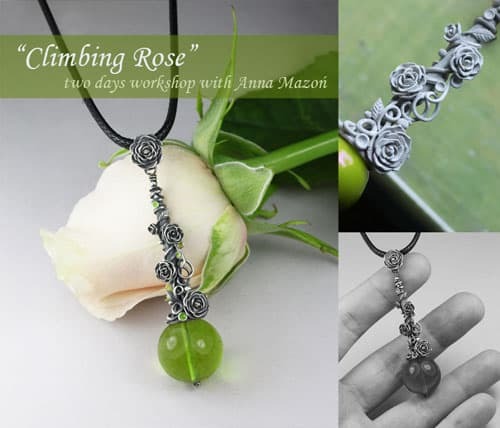 This is a two day metal clay workshop in which you will learn to make a Climbing Rose Pendant with Polish metal clay artist and tutor Anna Mazon. 20g Art Clay Silver is included in the price. This class runs from Thursday 30th May 2019 to Friday 31st May 2019. 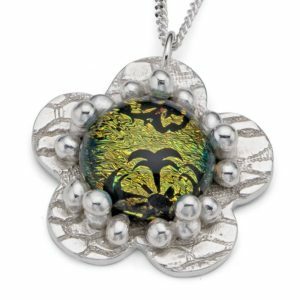 This pendant features a really unusual, elongated bead cap construction, adorned with beautiful, fully handmade, climbing flowers, interlacing coils and other small ornaments. Interesting construction techniques, making long hollow tubes without using extruder, various approaches to working with coils wet and dry is what this workshop is about. 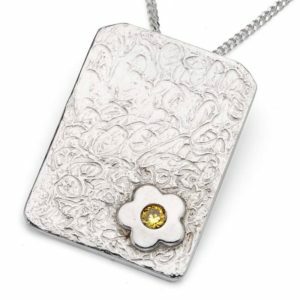 Pieces created during this class may look in many different ways – you don’t have to make climbing roses although we will be focusing on this. For those interested Anna will show you for example how to make beautiful morning glories. We will also be making a matching, flowery bail for your pendant. As usual in Anna’s classes, using the same set of techniques everyone can create something slightly different. If you have any favourite tools please bring them. 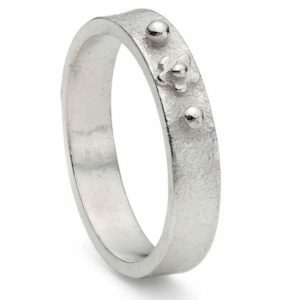 Beads- fully drilled – anything between 10 and 18 mm. It’s good to have a few to choose from. Two pieces of wire – both thicker than 0.5 mm (24 gauge), but one additionally thicker than the other (for example 0.5 and 0.6 mm or 0.5 and 0.7 mm or 0.6 and 0.7 mm etc.). They should be around 10 cm long (or more) and rather straight. 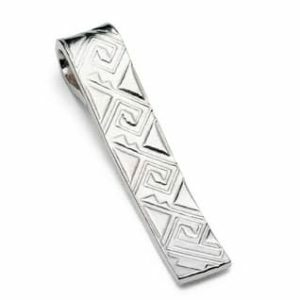 The thicker one in the pair doesn’t have to be silver – it can be anything.